The groundbreaking exhibition The Arts and Crafts Movement in Europe and America, 1880-1920: Design for the Modern World, places a crucial story in decorative arts history into an international context for the first time. Organized by the Los Angeles County Museum of Art, the exhibition showcases more than 300 Arts and Crafts objects from the United States and throughout Europe-including furniture, ceramics, metalwork, textiles, and works on paper-borrowed from 75 institutions and private collections. The New Republic calls the show a "first-rate exhibition…a cause for celebration." Click here to read the review. To read a review by The New York Times, click here. 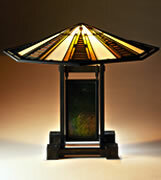 The Arts and Crafts Movement was a response to a century of unprecedented social and economic upheaval. Its name was coined in 1887, when a group of designers met in London to found an organization-the Arts and Crafts Exhibition Society-for which applied art would be valued as equal to fine art. Many in the movement championed the moral and spiritual uplift that would come with the revival of making objects by hand. The improvement of working conditions, the integration of art into everyday life, the unity of all arts, and an aesthetic resulting from the use of indigenous materials and native traditions also were central to the movement's philosophy. The Arts and Crafts Movement was an international one: it touched countries as far apart as Russia and Scotland, the United States, and Australia. The exhibition, curated by LACMA's Curator of Decorative Arts Wendy Kaplan, a foremost authority on the subject, focuses on 12 representative countries: England, Scotland, Germany, Austria, Hungary, Denmark, Norway, Sweden, Finland, Belgium, France, and the United States, the exhibition explores how the movement's ideals were disseminated and then transformed in response to specific economic, cultural, and political conditions. The show displays masterworks by the best-known designers of the period, including William Morris, M.H. Baillie Scott, Henry Van de Velde, Peter Behrens, Josef Hoffmann, Eliel Saarinen, Gustav Stickley, Greene and Greene, and Frank Lloyd Wright. 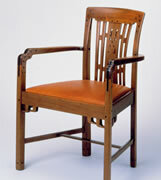 The Arts and Crafts Movement, in large part, was neither anti-industrial nor anti-modern. While its adherents idealized the pre-industrial past, they did not reject the present. They believed that machines were necessary but should be used only to relieve the tedium of mindless, repetitive tasks. Britain, at the very epicenter of the Industrial Revolution, was the center for designers most opposed to the dehumanizing consequences of factory production. Without joy in labor, making goods would have neither merit nor value. At the same time, they felt that objects should be affordable and useful, and therefore, objects such as the exhibition's Small Window Bench, made by the Charles P. Limbert Company in 1907, were produced in factories. The conflict between these two beliefs, and the attempts to reconcile them, comprised the focus of design debates during the first two decades of the 20th century. The use of design to express a country's identity is part of a movement now known as Romantic Nationalism. At the turn of the last century, many politicians, designers, craftspeople, and manufacturers sought to establish or reinforce their country's identity by idealizing its past. The material culture of Romantic Nationalism drew from the British Arts and Crafts, especially the movement's advocacy of indigenous design, traditional ways of making objects, and the use of local materials. For example, in Hungary, vernacular embroideries and dress became symbolic referents of national identity. In particular, the szur, a richly decorated, woolen overcoat worn by male peasants and shepherds, was widely discussed as an icon of the new consciousness and is represented in the exhibition by an elegant Hungarian coat designed by Júlia Zsolnay in 1905-10. The concept of completely integrating art and life was fundamental to Arts and Crafts beliefs and was constantly echoed in the movement's organizations and magazines. In the context of architecture and the decorative arts, the building and its furnishings were intended to form an environmental whole, ideally, one executed by the same person. The dream of unity was most fully-albeit briefly-realized in the establishment of utopian art colonies. Four of these are explored in this exhibition: C.R. Ashbee's Guild of the Handicraft in Britain; Darmstadt, Germany; Godollo, Hungary; and the Roycrofters of East Aurora, New York. Each constitutes its own unique paradigm of Arts and Crafts ideals. Some looked to the Arts and Crafts Movement to provide a small, still center of handmade work; some for a way to revolutionize the production and consumption of manufactured goods; and others to give material form to national aspirations. The legacy of the Arts and Crafts Movement can never be definitive, as people invented the movement that they needed in their particular locale. The Arts and Crafts Movement could claim the adherence of progressives and conservatives, proponents of the handmade and of industrial production, as well as those who believed that "the service of modern art" must include the revival of traditional crafts. The movement had to be both modern and anti-modern. These seeming contradictions were united by the Arts and Crafts Movement's quest for meaning in a time of radical change by its need to retain a sense of the individual in an increasingly mass society, and by its attempt to make mechanization and urbanization serve people rather than enslave them. "The movement provided a framework for many essential issues still being debated today," explains curator Wendy Kaplan, "the conflict between standardization and individuality, the question of whether a one-of-a-kind handcrafted object is superior to a mass-produced one, and the problem of defining what kind of design most benefits society." The exhibition at the Milwaukee Art Museum is made possible by Sue and Bud Selig. Additional support provided by Joan and Jack Stein and the Jerome and Dorothy Holz Family Foundation. George Washington Maher, Fireplace surround, From the Patrick J. King House, Chicago, Illinois, Made by Louis Millet of Healy and Millet, Chicago, Illinois, 1901. Oak, glass mosaic, and enamel. LACMA, gift of Max Palevsky in honor of the museum's twenty-fifth anniversary. Photo © 2004 Museum Associates/LACMA (ARS) NY. Charles Sumner Greene and Henry Mather Greene, Living Room Armchair from the Robert R. Blacker House, Pasadena, California, 1907. Mahogany, ebony, oak, and (replaced) upholstery, LACMA, gift of Max Palevsky. 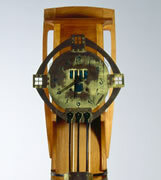 Gustave Serrurier-Bovy, Clock from René Felgères's house, La Cheyrelle, Dienne, France, Made at Serrurier-Bovy's workshop, Liège, 1903-4. Oak and copper. Royal Museums of Art and History, Brussels, IP.96.4. Photo © Musées Royaux d'Art et d'Histoire.